May, a full-time civil engineer and a part-time aspiring coach, began her fitness journey as a cardio junky. 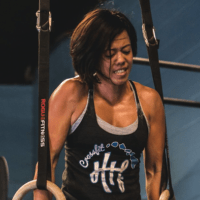 She started CrossFit in 2014 and soon became addicted to the adrenaline rush. Originally from Hawaii, May loves being on Guam and has plans to live here for years to come. In her free time, May enjoys going on food adventures, travelling the world, cooking, hiking the Japanese Alps, and spending quality time with her cat Kammie and the people she loves. My favorite thing about coaching is helping people achieve feats they never thought possible and tapping into their endless potential, whether it’s learning a new movement, hitting a PR, or simply showing up every day.